Blue sharks are nomadic animals, have an extremely widespread distribution and can be found in both temperate and tropical waters. Perfectly designed to cover great distances, their long pectoral and tail fins and slender body help them to make lengthy migrations to reach areas of dense food resources and find potential mates. 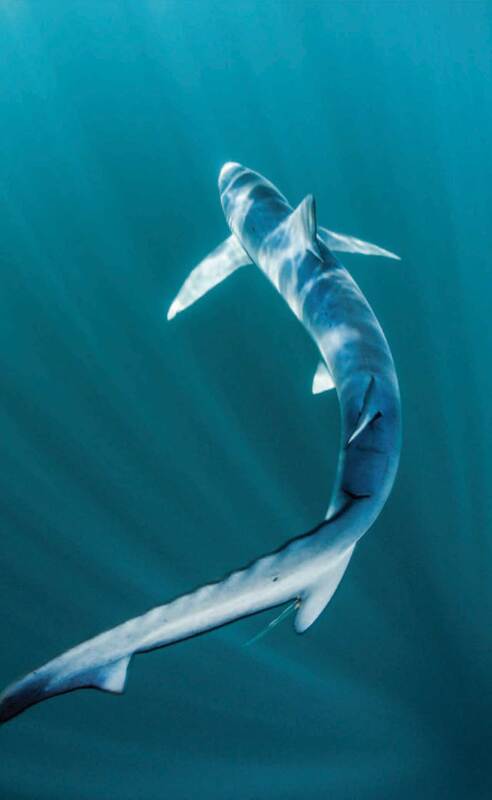 Tagging studies have revealed these sharks commonly travel distances of up to 2,700 kilometres, and it is thought they use open ocean currents to conserve energy and follow a clockwise pattern around the Atlantic Ocean. 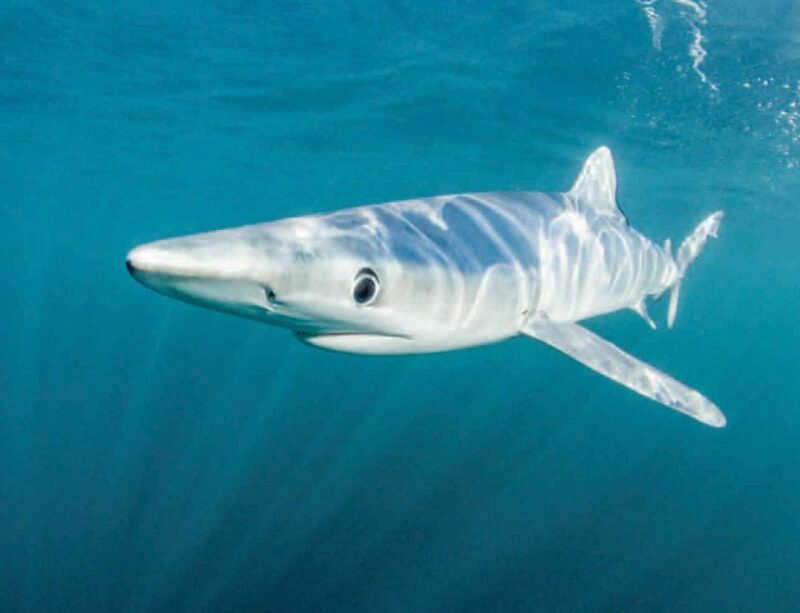 Fortunately for British wildlife enthusiasts, this route brings these beautiful sharks close to the southwest coast of England during the summer months, where local diver and photographer Charles Hood runs regular day trips for those interested in swimming with them. Having travelled to many different destinations to photograph sharks, I was delighted to discover last year that blue sharks can be reliably encountered in the UK and made immediate arrangements to charter Charles’ boat during some peak season August dates. I had been advised to keep an eye on the noxiously unpredictable weather in the days leading up to our departure, for it can make or break the trip. Too much wind can cause problems getting to the site but luckily that day the sun was shining and the ocean was calm. After making our way offshore and putting bait in the water, we just had to wait and hope that a passing shark picked up the scent. Minutes turned to hours as lunchtime passed and most of the group had given up hope when suddenly a small but distinctive dorsal fin broke the surface and made a beeline straight for the bait. As we frantically kitted up after hours of inactivity, more sharks arrived to investigate and we soon had three beautiful blues circling the boat. Once the sharks arrive, all of the action is at the surface, so all that is required to swim with them is a mask and snorkel. Cautiously we slipped into the water, trying our best not to spook the sharks after waiting so long for them to show up. I had imagined they would be a little skittish at first and keep their distance so was surprised when they immediately came within a few feet of my camera, taking particular interest in my strobes. It turns out that the blue sharks, is a very cooperative photo subject! As well as trying to capture nice pictures of the sharks I also made a conscious effort to look away from the viewfinder sometimes and watch them without the distraction of the camera. I find it fascinating to see how different animals react to you entering their world, and blue sharks have no problem sharing the water with divers. After nearly three hours swimming with up to five different sharks, it was sadly time to pull out the bait and head back to shore. As I watched the last of the sharks disappear below, I took a moment to reflect on the day’s events. I had just experienced one of the most exciting wildlife encounters of my life and it had happened right here in my own backyard!